We made a little impromptu visit to our boat yesterday because the kids were out of school and it was 80 degrees, and how could we not? It was our first overnight of the season and my brother and sister-in-law went with their kids too. Very fun and relaxing little getaway. I came home and found this waiting for me in the mailbox! The latest issue of Cloth, Paper, Scissors featuring an article I wrote. 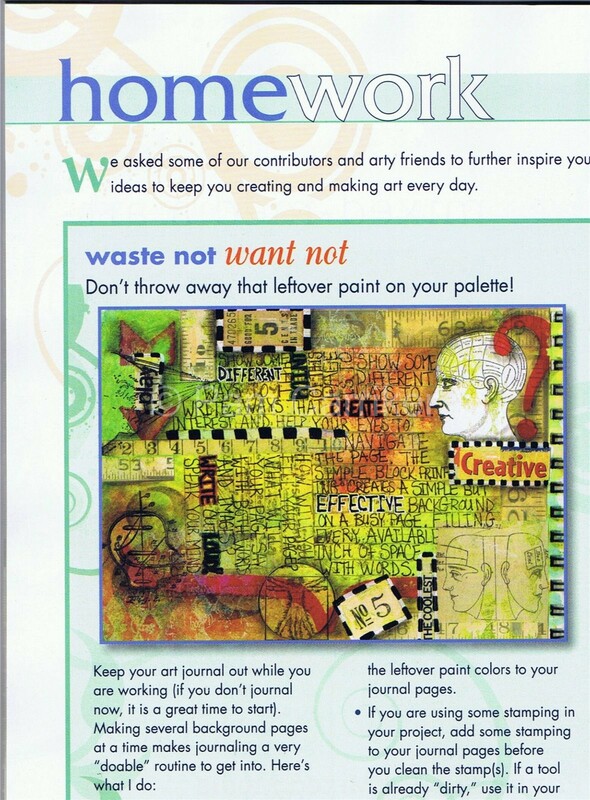 Also featured in this issue are two other Melange Team members, Nancy Lefko, and Sue Pelletier. Here are some little snippets from my article and a peek at the Homework section featuring some additional tips and one of my journal pages that those who are taking my Visual Journalism 101 online class will recognize. 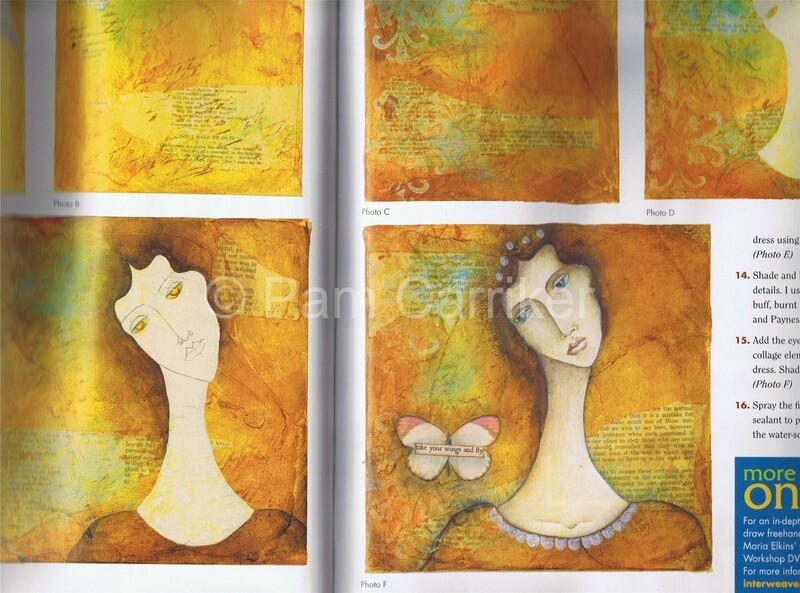 Included in this article are step out pictures/instructions for the process I use in some of my mixed media portraits. With Mother’s Day soon approaching, you will find the inspiration behind my portraits and why I find them so much a part of my art life. This issue has some wonderful articles and I hope you will be able to pick up a copy. Let me know if you do, I’d love to hear from you! A little insider info, the dress in this portrait, ‘Letting Go’ was inspired by my living room drapes. You just never know what your muse will lead you! Pam, I love your work. 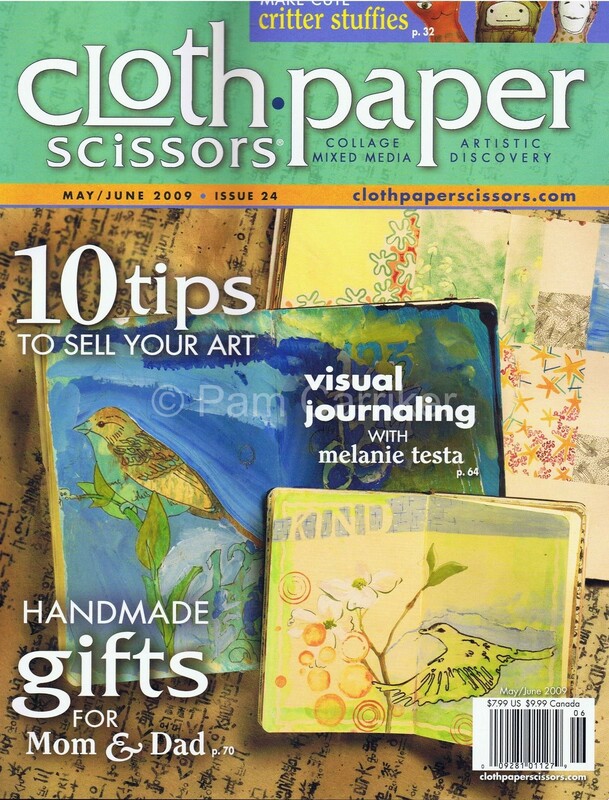 I have a subscription to Cloth, paper, scissors, and wait each month for it to turn up in my mailbox. Love it. Also, buy every Somerset Studio mag I can find! They are also an inspiration. Keep up the great work. Pick up my issue today. Congrats on your feature. I am still going over it tonight. Congratulations on your article. I love the piece you did. Thanks for taking us through the steps, I want to try that sometime. I love the golden yellow glow from this piece. Your drapes must be lovely too! Good job on the article. That is lovely, I’ll have to take a look at that article. Pam- I loved your article! I truly enjoy the drawing of the faces but the painting gives me a fit (it’s the mixing of colors and getting JUST that right color! )so I’m glad to have some different colors to try! congrats pam! i’m very proud of you. your work is wonderful. can’t wait til my copy shows up in my mail box! I seen the sneak preview online through CPS Embellishments and it’s a stunning article, so much inspiration and insight to your process. You capture a true emotional connection as you write the how to article! It all looks wonderful…wouldn’t mind doing that homework any time! Got it, read it, enjoyed it! I always devour the magazine when it arrives & did again this time. Thanks for a great article! Congratulations Pam! No magazine in my mail yet, but can’t wait to read the article… things are really flowing in such and energy based direction for you!! 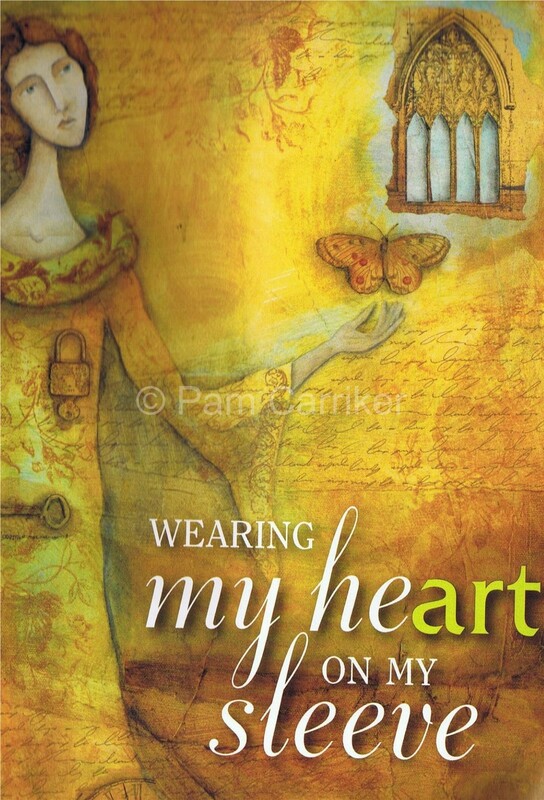 I got my copy of the mag yesterday and was so excited when I got to your page, because I wasn’t expecting it!Paulette Insall has been a big inspiration to me, too, so it was nice to read that her work is what got you to start painting women. Pam you’re so funny! If my drapes inspired me it would be a blank canvas, they are all white! Your work just keeps getting better and better. I am so honored to have an original “Pam”! I can’t wait to get the new magazine to all the wonderful, amazing art that is coming from Melange. You go girls! I LOVE your article and the photos are luscious !!!! So happy to share magazine space with my sister !! it loks wodnerful Pam..can’t wait to get my copy and read ALL of it. Can’t wait for my copy of the mag to arrive!!! Brilliant to hear you are in it!! Pam I am so excited! this looks wonderful, so I will be stalking my bookstore until it is in…unfortunately it takes much longer to come out in Canada :-(congrats on the feature, and I look forward to seeing my fellow Melange Team members in it as well.You guys rock!